A sentimental fog came over me as I closed UNIT PRIMES and I remembered one of my favorite literature classes when working on my bachelor’s degree over a decade ago. We read stacks of short stories and I recall enjoying that experience immensely. I found that short stories appealed to me in a way that novels did not. I especially loved the slice of life stories. UNIT PRIMES is the comic industry’s equivalent to the short story. In it, we have a story with little plot progression and small amounts of character development, but a solid and poignant story nonetheless. It is a science fiction slice of life story that is more intriguing the more I contemplate it. A boy, L-Bee, is rescued from the remnants of a planet destroyed by the Unit Primes. The beings that take him are fighting the good fight against the seemingly unstoppable Primes and for 90 pages we live this boy’s upheaval, connection to other beings, and finally their separation. It is an experience that a child simply should not have to endure, but this one does. The experience is well done – and tear inspiring for the characters and the reader – with deep connections to this world and the life many children live. The expressions, which come mostly from L-Bee as the alien life forms’ emotional characteristics are harder to differentiate, are what make the art connect emotionally with the text. L-Bee feels fear, confusion, love, and anger. He cries a lot, which is to be expected from a 12-year-old child who just lost his entire race to a planetary explosion. It is our compassion for L-Bee, expressed in the art, that creates the empathy and interest in the story. 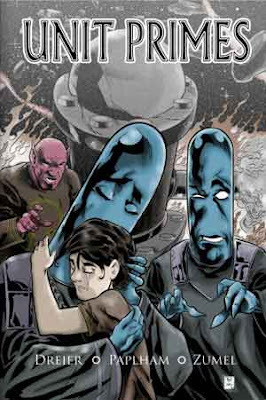 UNIT PRIMES is a comic that would have benefited greatly from the use of color. A well-chosen color palette should have been used to create the setting and tone and reinforce the theme of the story. Color would have helped the reader relate to L-Bee and would have created differentiation between Alo and Yiralo, who for the most part are indistinguishable except for Yiralo’s larger lips. The subject material is tough and is best for middle school and high school students. L-Bee’s life is tragic and gets no better at the end of the story. Other than a few cases of the word damn and its variations, there are no objectionable material. UNIT PRIMES is a study of human behavior in the face of tragedy and impeding doom. I think this slice of life story would be very useful in the classroom to help students study a small piece of life and dissect it. What makes the story interesting? Is there any real plot progression or character development? How does this story work? What makes it interesting? How do we connect with UNIT PRIMES? How does this story engage us differently than other works? I think it would be interesting to compare UNIT PRIMES with traditional short stories. The next text in the series, UNIT PRIMES: SALVAGE will be available soon. What a great idea for a blog! And what a necessary tool. I'll be back often!